In a large frying pan, melt 1 tablespoon of the butter with 1 tablespoons of the oil over moderate heat. Add the onions, 1/2 teaspoon of the salt, and the sugar and cook, stirring frequently, until the onions are well browned, about 20 minutes. Remove from the pan. In a large pot of boiling, salted water, cook the pasta until just done, about 13 minutes. Reserve 3/4 cup of the pasta water and drain. 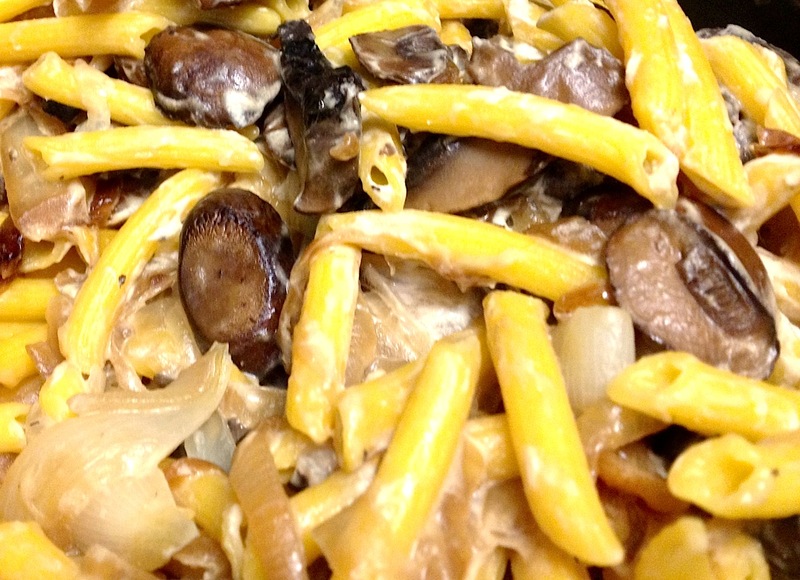 Toss the pasta and 1/2 cup of the reserved pasta water with the mushroom mixture, the goat cheese, and the Parmesan. If the pasta seems dry, add more of the reserved pasta water. Serve with extra Parmesan. Pasta. Good. Onions. Good. Goat's cheese. AMAZING!